In Mongolia, Bankhar dogs are thought to be “of the same spirit” as humans, and dogs are the only animals that are given names. When a Bankhar dies, its remains are typically placed on top of a mountain so it is closer to the gods and spirit world, and so that people do not walk over its bones. It is believed that humans can be reincarnated as dogs and dogs as humans. Upon death, a dog’s tail is cut off so that if its spirit is reborn human, the human does not have an embarrassing tail! The dogs were and are a huge source of pride to nomadic families. Unfortunately over the last 80 years, modern breeds have been brought into Mongolia. 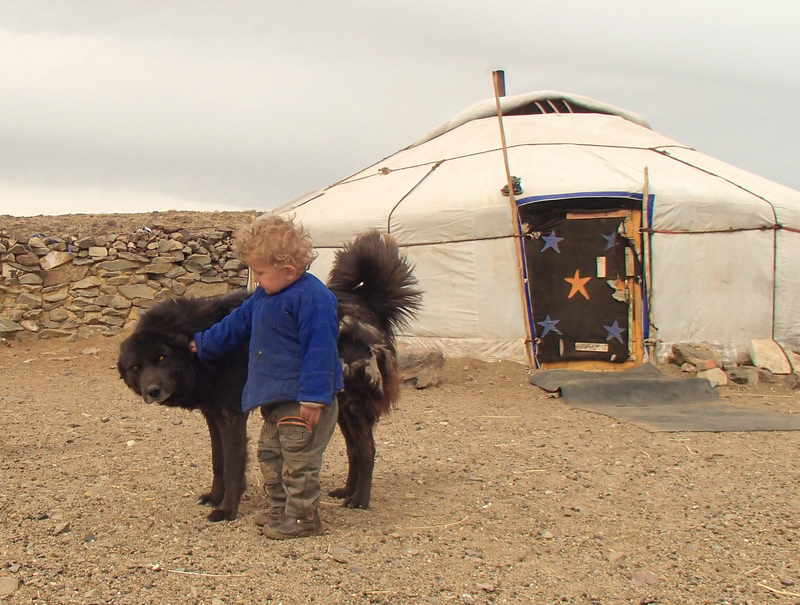 The Bankhar, which were historically the only dogs in Mongolia, are now very rare. Bankhar dogs are an ancient landrace, not a breed but a type of dog shaped through thousands of years of coevolution with humans driven by the need for an effective guardian of livestock on the Mongolian steppe. Bankhar are large, athletic, protective, and need comparatively little food for their size. They are perfectly adapted to the intense ecosystems of Mongolia. Bankhar may also be the progenitor of all livestock guardian dogs. Recent studies point to the origin of the domestic dog as central Asia around 15,000 years ago. Our DNA samples were used to support this hypothesis and in the paper (available here) Doug Lally was coauthor along with Cornell University professor Adam Boyko PHD, among others. What happened to the Bankhar? Kilgore – one of our younger males at our breeding facility. Showing great promise with sheep. Tall and athletic (over 31 inches) at 1.5 years old. 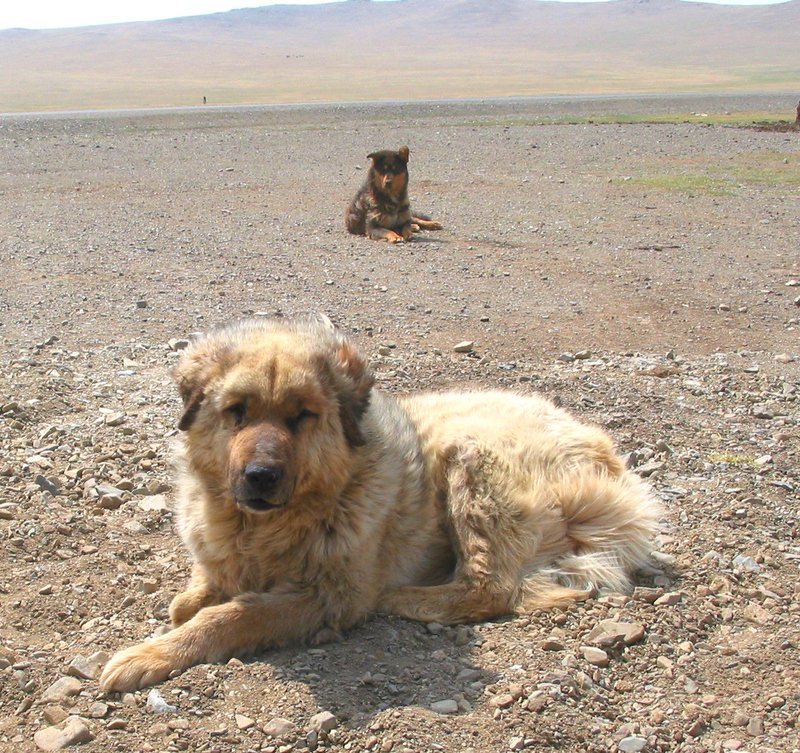 During the Communist era of Mongolia, which lasted from the 1920s to the 1990s, during which Mongolia was a satellite state of the Soviet Union, Bankhar dogs were let loose or exterminated when nomads were forcibly relocated in socialist-style settlements. Additionally, Bankhar dogs were targeted because of the mistaken idea that the dogs spread illness to people and livestock. Bankhar pelts became fashionable for stylish Russian coats, and the largest dogs were killed to feed the growing dog coat industry. In general, the Soviet-based Communist education system lead to a loss of knowledge of how to breed, train and employ livestock protection dogs. 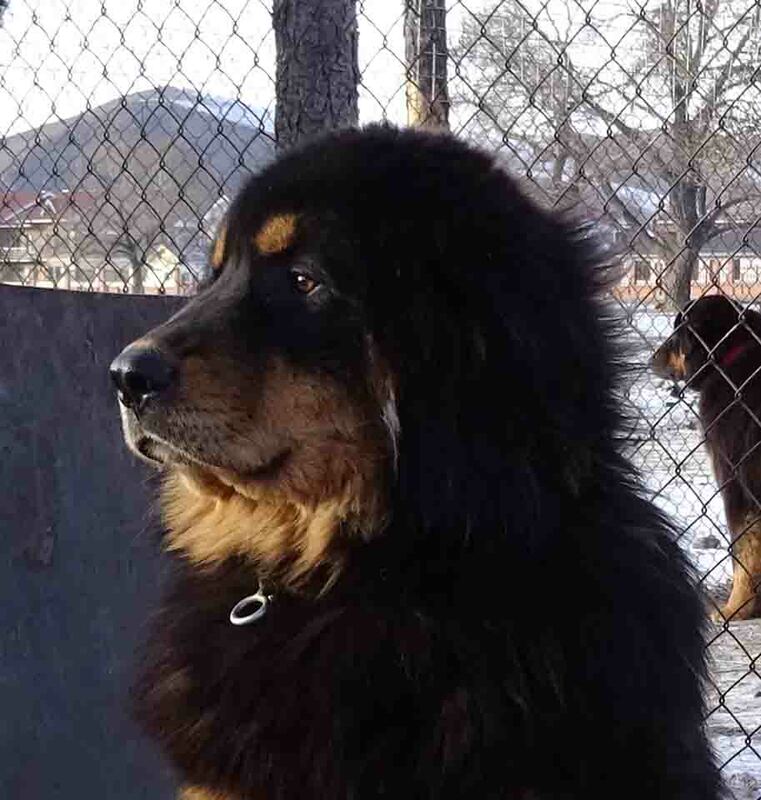 A current danger to the population of Bankhar is interbreeding with the fashionable Tibetan Mastiff. Mastiffs are genetically distinct from Bankhar and are not working dogs. Mixed Mastiff genes in the Bankhar gene-pool have degraded the quality of the working dog genes of Bankhar. There are few pockets of true Bankhar dogs left. 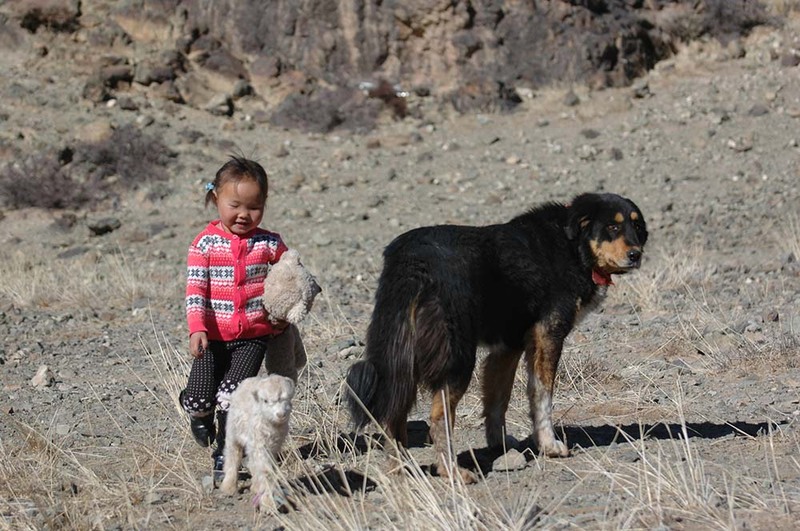 Mongolian Bankhar Dog Project has identified them using DNA testing and has isolated these dogs for breeding the next generation of genuine working Bankhar guardian dogs. Livestock Protection Dogs (LPDs) have been used by humans for millennia to protect herds of domesticated livestock and goats from predators. The effectiveness of LPDs in reducing livestock predation is well documented on every continent. Currently, over 50% of the sheep ranchers in the western United States use livestock protection dogs as part of their management programs. The Bankhar, like many other livestock guardian dogs across Asia and Europe, is not a breed, but a ‘landrace’. A landrace is a domesticated species of animal that has evolved over time, in a natural and cultural environment, and in this case has adapted to the local agricultural and pastoral conditions under the guidance of nomadic herders. This is a critical distinction from the word,‘breed’. Bankhar dogs have evolved and co-evolved with humans to fit to a very particular niche. The reason why a Bankhar dog looks and behaves as it does is to maximize its efficiency and effectiveness as a working livestock protection animal. This means that Bankhar near Kazakhstan will have more influences of the dogs in Kazakhstan (these are just the natural regional variations of the Central Asian Ovcharka, not to be confused with modern show breed of the same name). The same goes for Tibetan livestock guardian dogs. It is this continuum of traits and a continued gene flow that keeps genetic diversity high. High genetic diversity ensures that the dogs are able to adapt to changes or roles effectively, as well as help to avoid deleterious recessive genes from being expressed in the population or an individual. It is our policy to avoid referring to the Bankhar as a breed and not to distinguish it substantially from other forms of the great landrace of dogs from Spain to Mongolia. We do feel it is important that our dogs represent the naturally evolved variations of the Bankhar found within Mongolia. We use DNA analysis to ensure that our dogs do not have modern dog breed genes in their make up. However, we do not distinguish genes from “neighboring” natural dog types, as these genes have always moved into and out of the genetic makeup of the Bankhar. Colors: All coat colors are possible, but white is rare. Most common is black and mahogany with mahogany “eye spots” over eyes and white patch on chest (this coloring is know ans the Mongolian Four Eye Dog), but tan, brown, and black and white are also common. Mongolians traditionally like the darker “four eye” dogs since it helps them distinguish their dogs from wolves. The “extra” eyes are also thought to see into the spirit world. Coat: The coat of the Bankhar tends to be very full and long (3-4 inches, or about 9 centimeters) in the winter with a very heavy undercoat. However, due to the vastness of Mongolia and the variation in climate, the Bankhar seems to have a plastic response to climate conditions and does not grow such a heavy coat in warmer regions. This is relative of course since Mongolia is one of the coldest places on earth with temperatures ranging from 110°F to -55°F (43°C to -48°C) with a yearly average of 31°F (-1°C). These dogs are lighter in build and more athletic than their nearby relatives the Tibetan Mastiff or Central Asian Ovcharka. DNA analysis by Cornell University indicates that the Bankhar has very high genetic diversity (this is related to a more primitive genome and high gene flow between regional “races” of a landrace versus the decreased genetic diversity of a standardized breed). Bankhar are comparatively long-lived. 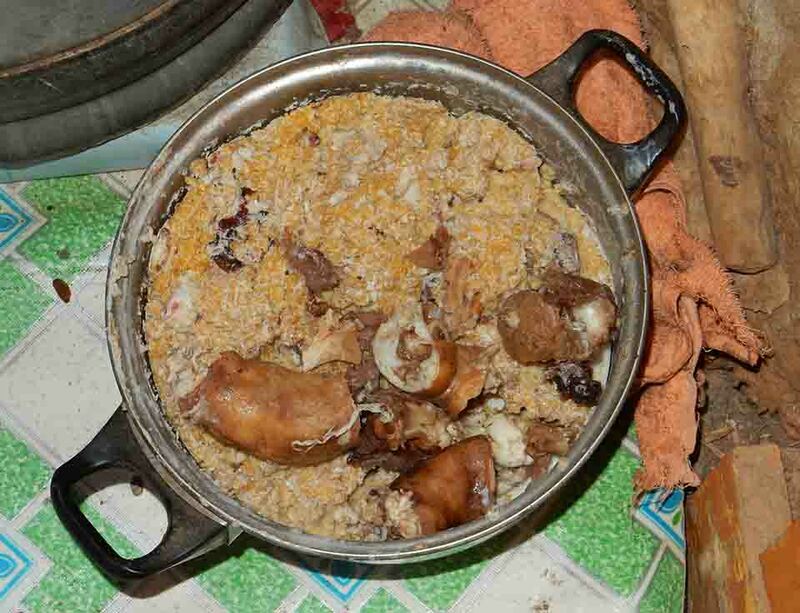 Examples of 15-18 year old dogs working with nomads in the field is not uncommon – this is of interest since most Bankhar never receive veterinary care and eat solely boiled livestock innards, rice or noodles, and bones. Bone diseases such as hip dysplasia seem to be very rare. This might be an artifact of survival; if a dog had these types of issues it would not make it in Mongolia. However we have not collected any reports from nomads ever having seen issues that could be explained as a bone disorder. Our experience and data show that the Bankhar breeds once a year in Mongolia (one of the coldest countries in the world). In a less hostile climate it is possible that they might breed more often – we simply don’t know. Bankhar, like most livestock guardian dogs, have an independent nature and tend to think for themselves. They are very loyal to their charges and protect them with their lives. They do not tend to be dogs that chase predators for vast distances, but they will attack predators without hesitation if the predator does not back down or leave the area immediately. Bankhar are not very aggressive toward people unless raised to be so. Once introduced, a working Bankhar will typically ignore a human and return to its protection job. Bankhar will not let people approach their charges if they are unaccompanied by a human the dog trusts. Raised well and socialized with people, Bankhar are like any other pet dog, trustworthy and part of the community.